Whether your commercial kitchen, industrial facility, warehouse or processing plant needs a new sprinkler system, industrial fire suppression, portable fire extinguishers and cabinets, grease exhaust cleaning services or grease filter exchange, call AAA Fire Protection Services. We are trustworthy, dependable and affordable. We have the best trained technicians in the industry, and we’re always learning new techniques and technologies. AAA Fire Protection Services prides itself on really caring about our Modesto with the highest level of customer service. When it comes to your safety, we know there are no shortcuts. Safety and protection from kitchen or industrial fires can never be taken lightly! 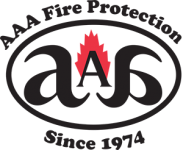 Established in 1974, AAA Fire Protection has serviced thousands of commercial clients throughout Modesto and the surrounding communities. We are a personalized, family-owned business we have the highest dedication to customer service and experience in the industry.